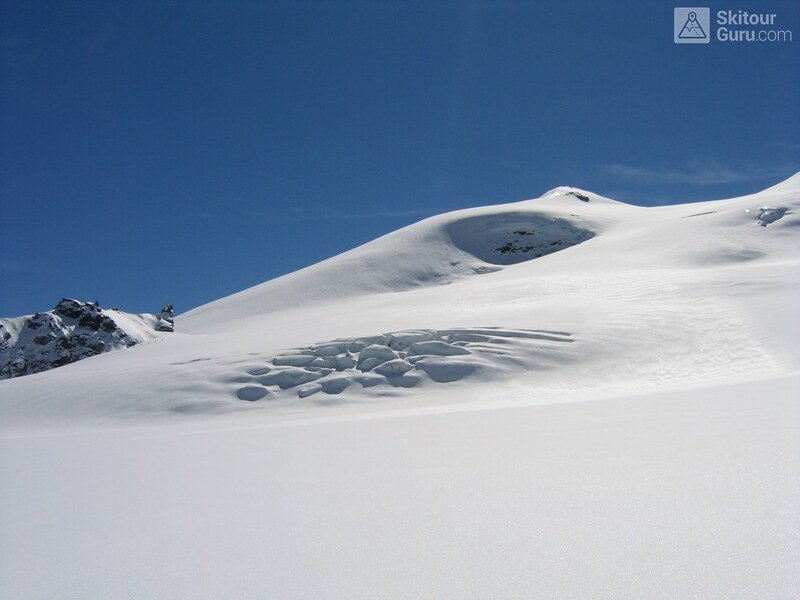 Fluchthorn (Britannia Hütte, Wallis) is an optimal acclimatization tour for 4000 above Saas Fee and can be managed at the same time as the Strahlhorn. ALLALINHORN (Britannia Hütte, Walliser Alpen) is one of the lightest 4000 in the Alps. By Metro in Mittelallalin and only 500 metersto the peakl. In the case of excellent conditions the downhill slopes from the top west cross to the Feejoch. Rimpfischhorn is the most demanding ski tour of Saas Fee - Britannia Hütte (Walliser Alpen). Dangerous big cracks and at the finish climbing terrain. Strahlhorn (Britannia Hütte, Walliser Alpen) is a classic glacier tour from Britannia Hütte. 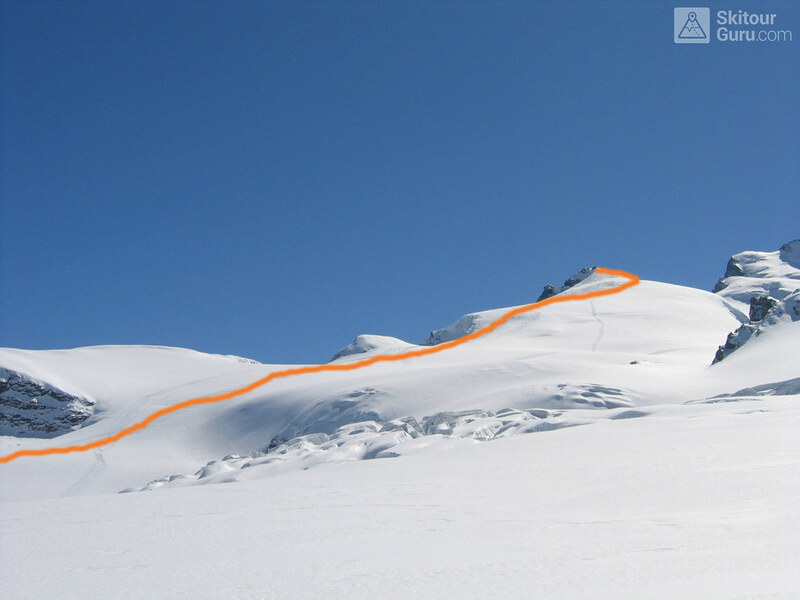 From the Adlerpass saddle, you usually go skiing to the top. If there is less snow then on the crampons with an ice axe. Ideal lookout peak. To get off Saas Fee, take the Metro to the "window" at 3460 m to the Hohlaub Gletscher and start the ascent after a short ride. ALPHUBEL (Britannia Hütte, Walliser Alpen) is seemingly lighter 4000vka, but over are dangerous glacial cracks. 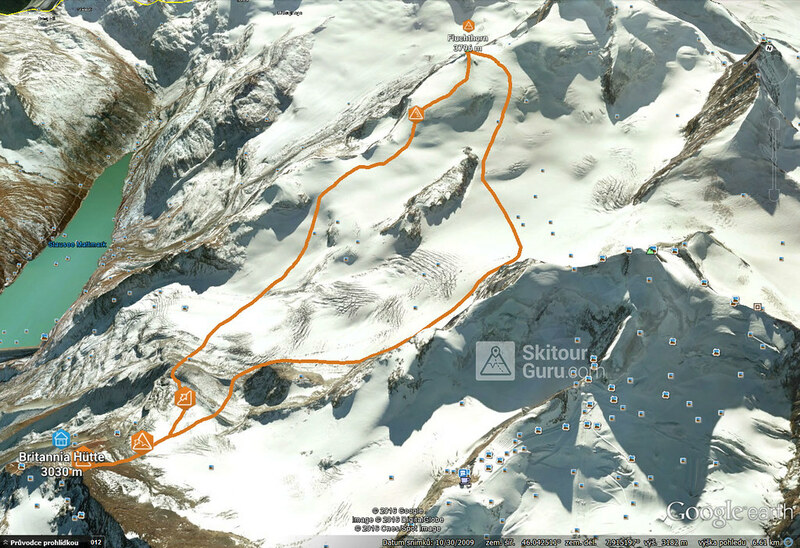 Ski alpinists can also go from the Saas Fee ski area, most not far from the cable car station Langfluh . The skitourguru.com authors love and map ski tours. It spreads the ideas of safe backcoutry skiing and skialpinism. We bring insights, inspiration, information - in the form of articles and pictures... ... Clearly and in one website. For you, skialpinists, ski tourers, ski mountaineerers and skiers with climbing skins! What is backcountry skiing ?